Thursday, 8 November 2018, 10:15p.m. 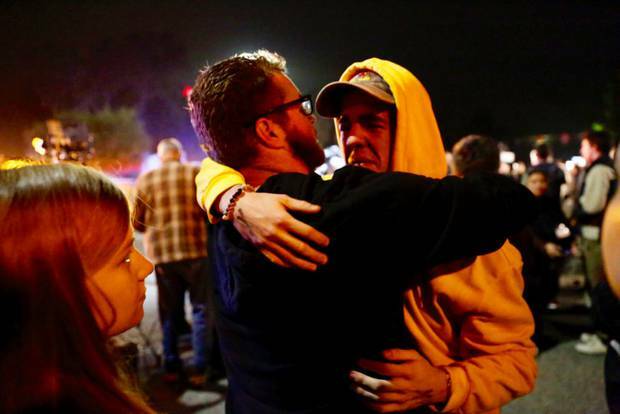 A gunman opened fire inside a crowded country-music bar late Wednesday in Southern California, killing 12 people, including a sheriff's deputy who had rushed inside to confront the shooter, authorities said. The gunman was later found dead inside. 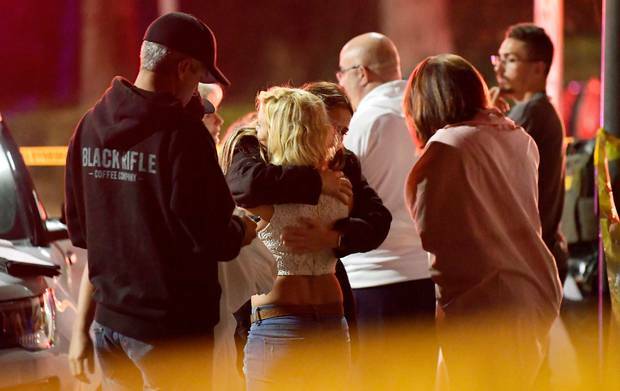 The gunfire erupted as people were line dancing on "College Country Night" at the Borderline Bar & Grill, a popular nightspot in Thousand Oaks, California, witnesses said. 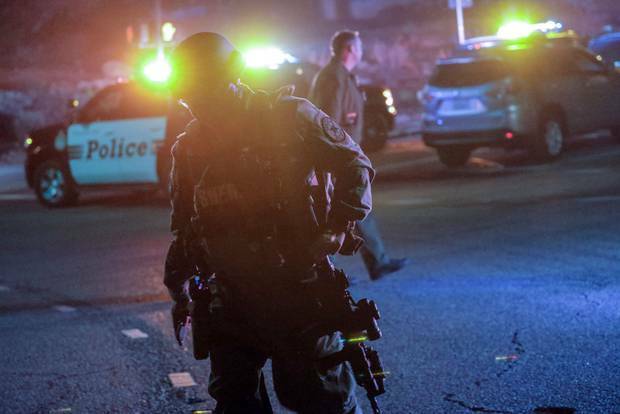 Among the dead was Ron Helus, a veteran sergeant in the Ventura County Sheriff's Office who was mortally wounded when he responded to the incident northwest of Los Angeles just minutes after 911 calls began flooding in, authorities said. "It's a horrific scene in there," Dean told reporters. "There's blood everywhere. The suspect is part of that." Dean said he had no reason to believe that there was a link to terrorism, "but we certainly will look at that option." Helus, the deputy who died at the hospital about an hour after sustaining his injury, was a 29-year veteran of the force and was expecting to retire soon. He was survived by a wife and a son. "He died a hero," Dean said, his voice cracking, "because he went in to save lives." President Donald Trump said on Twitter that he had been briefed on the shooting, and praised the "great bravery shown by police," adding: "God bless all of the victims and families of the victims." 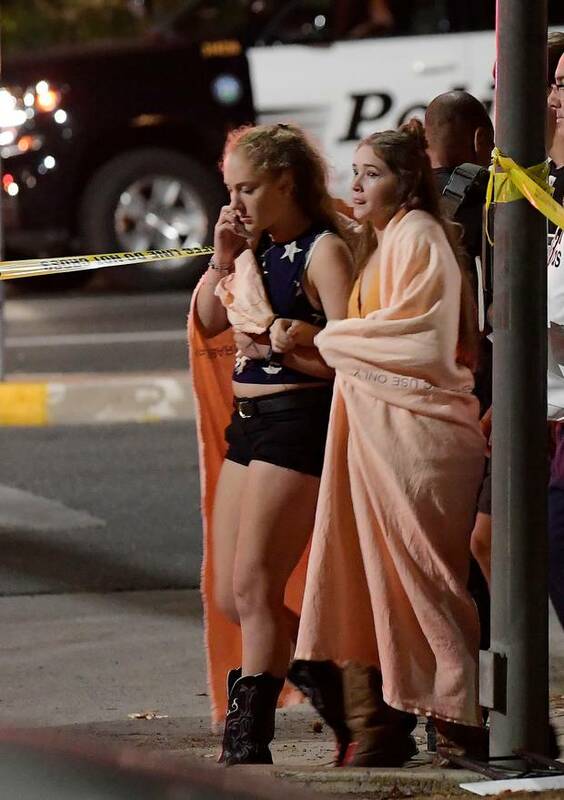 In addition to the dead, Dean estimated that there were upward of 10 to 12 shooting victims who were "rescued from the scene and taken to local hospitals." Additional victims with minor injuries fled the scene on their own, he added. "I know there are parents wondering, 'Oh my gosh, was one of my children in there? Or was it my sister or my brother?'" he said. Dean said the mass shooting, at a bar packed with students from nearby colleges, "is part of the horrors that are happening in our country and everywhere, and I think it's impossible to put any logic or any sense to the senseless." 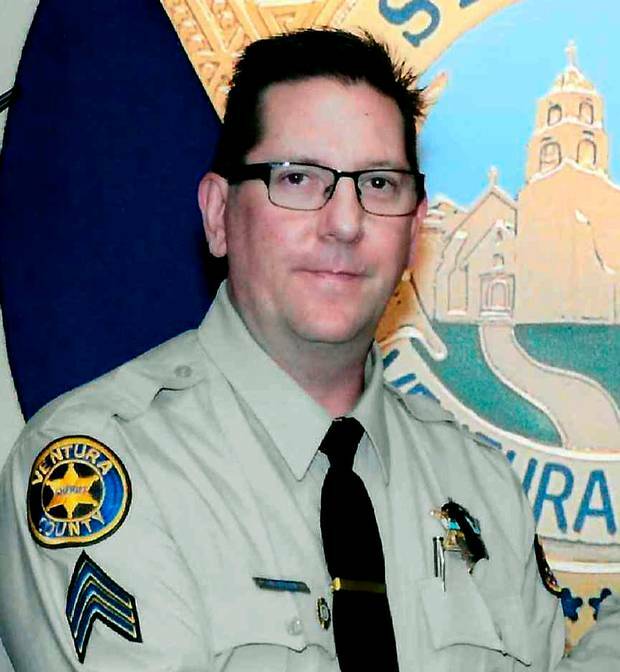 Helus, the sheriff's sergeant, entered the venue with a California Highway Patrol officer several minutes later, at which point Helus was struck "multiple times," Dean said. The CHP officer stepped back and secured the perimeter. 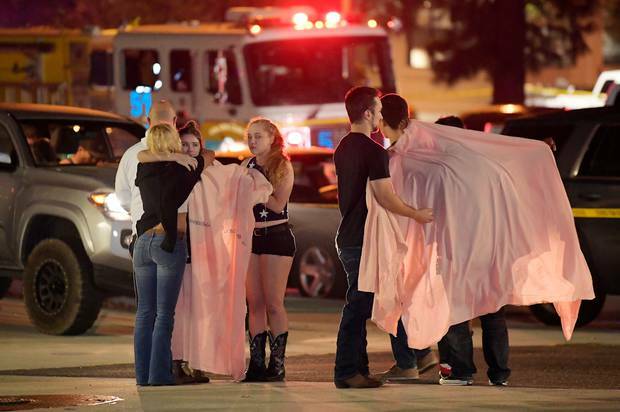 "It was sheer panic," said Teylor Whittler, 19, who was inside the venue at the time. "Everyone ran and dropped as fast as they could." She said she ran to the back door, where people crowded during a pause in the gunfire. "And then all, of a sudden, a couple of guys started running to the back door and said, 'Get up he's coming.'" The Borderline Bar describes itself as Ventura County's largest country dance hall and live music venue. With a dance floor covering about 2,500 square feet, it is open until 2 a.m. five days a week. 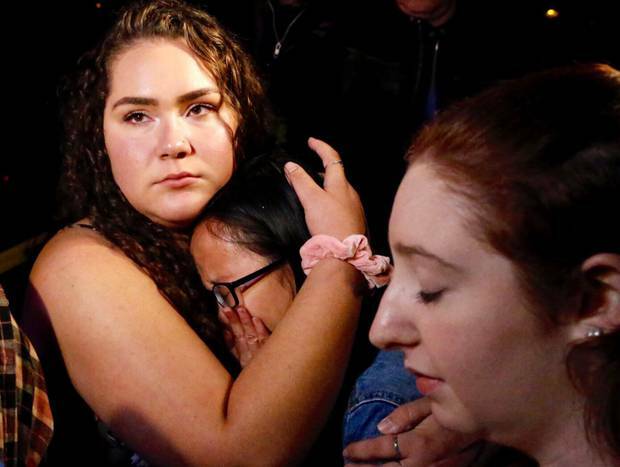 Pepperdine officials said that multiple students from the school were at the bar during the shooting. "University officials have been working on site with law enforcement to confirm their safety and well-being, and our prayers and condolences are with everyone impacted by this senseless act of violence," the school said. "He motioned for me to follow him. I thought that was the best option at the time," she said. "[We heard] gunshot after gunshot. I heard glass breaking. I heard commotion and screaming. … We kept thinking it would stop for a while, that we were okay, and then it would start up again." When the authorities re entered the nightclub, they found the suspect - whom they believe to be the lone gunman - dead inside, Dean said. "We don't know who shot the deputy," he added. "We don't know who shot anybody at this point." Matt Wennerstrom, a regular at the bar, described the shooter as a "tall figure," over 6 feet, wearing "all dark clothing." He said he saw the gunman open fire on employees working at the front of the bar. "At that point I grabbed as many people around me as I could and pulled them down underneath the pool table that we were closest to until he ran out of bullets for that magazine and had to reload," the eyewitness said. During the pause, Wennerstrom, 20, said he and others threw bar stools through a window and helped people escape. He told ABC he was able to push "30 or 35 people through that window." "He fired the first shot," the stepfather said. "And I knew it was real. My son thought it was a joke, so I pulled him down and got some cover. I looked up, and he was moving to the right. He shot the front doorman, who was just a young man. Then he shot the cashier, just a young girl."